In addition to supporting our full-time research fellows, we would like to develop a medical student and trainee-led international consortium on burns and scarring research. We aim to harness the dedication and imagination of medical students and trainee doctors from the UK and across the world to develop and advance high quality research projects which will benefit patients. On this page, we will be posting details of the collaborative projects which we are currently supporting. Read on to see how you could get involved. If you have an idea for a collaborative research project in burns or scarring which you would like to take forward with us, get in touch by clicking here. to show that applying cool running water for 20 minutes reduces the depth of a burn by 25%. knowledge of burns first aid on a global scale as well as the causes of inadequate first aid provision. interest in delivering this project. Assess burns first aid practise in several countries and how it compares to the ideal. Identify reasons behind poor first aid provision. Doing this will establish the size of the gap between ideal and actual provision and the reasons for its existence in different settings. This information could be used to inform future public health interventions and ultimately, improve outcomes after burn injuries on a global scale. Medical students, doctors in training and allied health professionals worldwide interested in burns, first aid or plastic surgery. By taking part in this project, you will be helping to advance our understanding of the nature of and reasons behind gaps in global first aid for burns. In addition all data collectors will be Pubmed citable collaborators on any resulting papers which will be published under one main name: The Restore Collaborative. 100 words describing your background and why you would like to be involved in this project. This is a trainee led research project surveying the public perception of keloid scars. The public are asked about aetiology, symptomatology, epidemiology and treatment. Data is collected across different countries within Australasia, America and Europe giving an international comparison between populations. The overall framework which will be followed in carrying out this project is described in the flowchart below. Data collector recruitment is ongoing worldwide. The full data collection protocol is available for download here. This project began in Ghana as a collaboration between Mr Jonathon Pleat and Guy Stanley, the winner of the Restore Research Essay Prize in 2015. The public in general know that keloids are scars. Those with the highest level of education know the most about the condition. 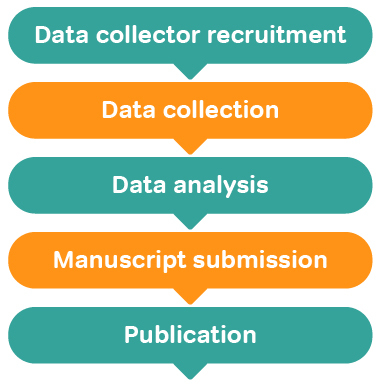 Once data collection is complete, the stages of analysis and write up begin with the aim of publishing in a peer reviewed journal, giving credit to everyone who has collaborated towards this achievement. Where in the world are you recruiting data collectors? What are the timelines for the project? How do I collect data for the project? This is a field work project which involves going into the public space to ask people, face-to-face, what they know about keloids. We use a standard protocol that specifies how, when and where to survey. Each survey takes 5-10 minutes to complete and the data collection can be comfortably completed in 5 days. What if the first language of my area is not English and I am surveying a non-English speaking population? The survey can be translated: strictly. We ask that you translate it from English into the target language by a native speaker of both languages THEN get the translation converted back into English by a different person. If it matches the original then the translation is satisfactory. We apply this process for consistency and accuracy. What if I want to get involved in more projects like this? We have a regular series of studies that will advance knowledge, care and also, the education and CV of the collaborator. Get involved, you’ve everything to gain!